Greencastle, Indiana wanted to make their new parking structure stand out while adding a creative element to the surrounding architecture. 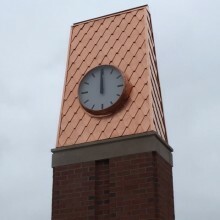 Working with Gibraltar Construction and Ratio Architectural Firm, Americlock provided vital feedback on how to build a clock tower that would withstand the test of time while adding a little extra flair. The tower came to life using images from the architect’s rendering and Americlock’s CAD drawings. Using CAD drawings was important on this project to ensure a proper fit between the different parties working on the clock tower. While working with Americlock, the client was able to keep the project on time and, most importantly, within their budget. 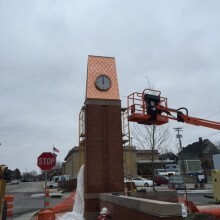 The skeleton of this clock tower began to take shape starting with an aluminum frame. 6061 aluminum extrusions were used to prevent rust on the inner workings of the tower. Covering the aluminum is 1″ weather treated plywood sheathing screwed into the frame followed by a layer of tar paper. Next, Americlock built custom .040 copper clad canister clocks to integrate into the tower. The copper was left without a clear coat or lacquer finish in order to allow the clocks to patina naturally along with the rest of the tower. Over 100 copper diamond shingles completed this beautiful tower. Meticulously laying these diamond copper shingles on the roof, Americlock started from bottom to top taking careful steps to make sure all areas were properly flashed to keep water out. The shingles were also left to patina naturally, allowing the clock tower to age gracefully. Inside, LED lights illuminate the clocks so they can be seen from afar at night while giving the client a zero maintenance lighting system. The lights will turn on in even the coldest of Indiana nights without the flickering issues of fluorescent lights or the discoloring of neon lights. Additionally, the LED lights used are low voltage and energy efficient, saving the client money over the long-term. Installation took place with Americlock factory installers leading the charge. Using a template, they drilled holes into the concrete tower to mark where the anchor bolts holding the new copper tower would be placed. Gibraltar Construction then assisted in carefully lifting the tower into place. With everything fitted in, the next step was to complete the wiring. Since the client could not house the controller in a climate controlled environment, Americlock brought that to them by way of a fiberglass heated and cooled enclosure. The enclosure allowed the client to house the controller in a locked and protected space while keeping it the proper temperature. 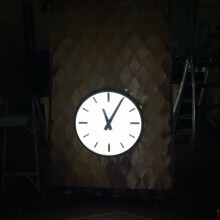 Once all the wiring was completed, the clocks were turned on. Overall, the project went very smoothly thanks to the proper planning and coordination between all companies involved. The end results were immediate to the client and they were thrilled. 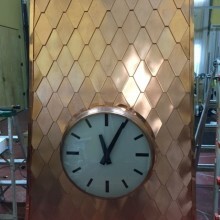 They had chosen the right clock company to work with to ensure an on time and on budget delivery that the community will enjoy for years to come.